On March 8, 2019, Justice Minister Mark Furey proposed amendments to the Judicature Act that would expand the unified family court (UFC) system across all regions of Nova Scotia. The announcement coincides with the 20th anniversary of the UFC in Nova Scotia, which is known as the Supreme Court of Nova Scotia, Family Division. Presently, UFCs are available only in Halifax, Sydney and Port Hawkesbury. The proposed change would allow all Nova Scotians to have family matters, and related property issues, decided by a single court rather than two. Additionally, married individuals will be entitled to access the UFC prior to petitioning for divorce. Proponents of UFCs are optimistic that the expansion will lead to reduced stress and cost for family litigants. In Canada, jurisdiction over family law is split between the federal and provincial governments. Superior courts, which are presided over by federally appointed judges, enjoy exclusive jurisdiction over divorce law and all corollary matters such as matrimonial property division. Provincial courts, whose judges are appointed by provincial/territorial governments, are responsible for hearing matters relating to the separation of unmarried couples as well as many cases of child support, access and custody. UFCs permit all aspects of family to be heard by a single court, presided over by a superior court judge. 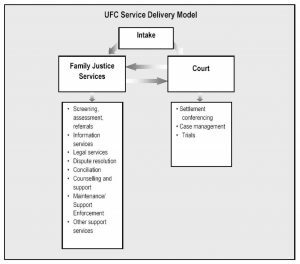 The concept of the UFC was first introduced by the Law Reform Commission of Canada in 1974 to resolve courts’ splintered jurisdiction, and offer a simplified, user-friendly court system that would allow “one-stop shopping” for family law services. The UFC was envisioned to ease the confusion and financial burden of many family litigants, who find themselves bouncing between two courts to resolve their legal issues. UFCs have since been introduced in seven provinces, each with their own unique procedures. However, a key element of each model is the intake process, which facilitates access to information and resources such as mediation and conciliation processes, counselling, legal advice and other support services. A 2009 report from the Department of Justice concluded that UFCs enable better access to specialized judges and out-of-court dispute resolution, which can result in less adversarial processes and more efficient outcomes. Source: Justice Canada (2004). Results-based Management and Accountability Framework for the Unified Family Courts, p.8. The proposed expansion of UFCs in Nova Scotia will require up to seven new federally appointed judges, which has already been approved by the federal government. If you have any questions about the unified family court process, please speak with one of our Family lawyers. Department of Justice, Evaluation Division, “The Unified Family Court Summative Evaluation: Final Report” (March 2009), online: <https://www.justice.gc.ca/eng/rp-pr/cp-pm/eval/rep-rap/09/ufc-tuf/ufc.pdf>.